From left: Colin Firth, Keira Knightley, Bill Nighy, Martine McCutcheon, Hugh Grant, Alan Rickman, Laura Linney, Liam Neeson, Emma Thompson. The film has launched careers. Thomas Brodie-Sangster — who played Sam, the precocious kid who falls for the girl with the same name as his recently deceased mother — has gone on to appear as a regular character on “Game of Thrones” and as a lead in the ongoing Maze Runner franchise. Still, it’s the actor who played Sammo’s step-father whose post-“Love Actually” movies have made the most money. Liam Neeson’s parenting in the movie was questionable — encouraging a child to sprint through security toward an airplane post-9/11 is never good fatherhood — but Neeson’s later attempts at parenting were even worse, oftentimes resulting in the child being Taken. That awful parenting, though, led to an outstanding and lucrative franchise. Whose movies after ‘Love Actually’ made the most money? Who made the best movies after ‘Love Actually’? And it’s those enduring performances and staying power that sell this movie. 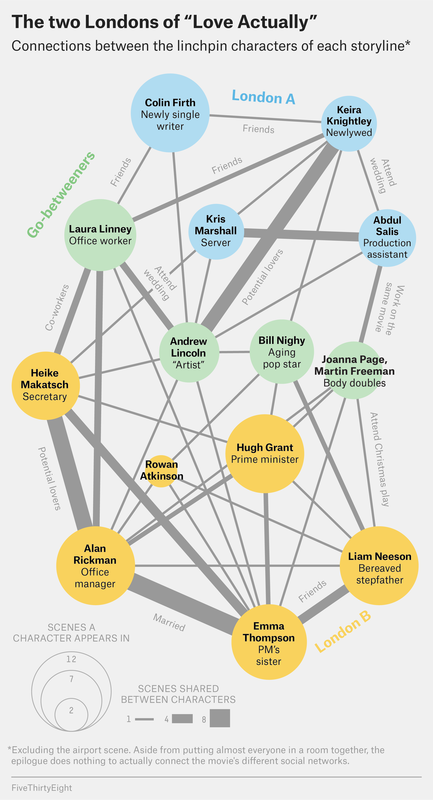 Even if you are an emotionally dead monster, you have to admire how ably the screenwriters juggled the different plots for Neeson, Thompson, Hugh Grant, Colin Firth, Keira Knightley, Martin Freeman and the other A- and B-list Brits who pop in and out of the movie. 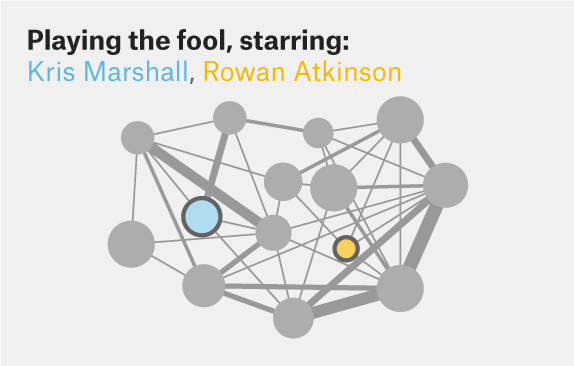 Plot the movie’s social network by how many scenes the pivotal characters shared,2 and you find that the linchpin of it all — the axis on which the world of “Love Actually” turns — is that schmuck with the cue cards, played by Andrew Lincoln. He’s the dumbwaiter in this “Upstairs, Downstairs” key party. The network analysis also reveals two Londons in love: one young, one a little less young; one rich, one a little less rich; one white, the other pretty white as well. This tale of two cities is a mirrored one, with one side’s romantic narratives echoed in the other’s. Or how about a classic tale of boy-meets-and-ogles-girl-who-works-for-him? In London B, Grant plays the newly elected prime minister (he also happens to be the brother of Thompson’s character). Things start to go off the rails when he falls for the “chubby” maid on staff. If you can’t stomach that plot’s relentless fat jokes, there are fewer (but not none) in the London A version, where Knightley-wedding-attendee Firth takes the meet cute to the French countryside. In the movie’s only slow-motion scene, we watch the camera pan up and down Firth’s Portuguese housekeeper as she strips to her underwear before jumping in a lake. Not zany enough for you? In London A, the catering staff at Knightley’s wedding includes Kris Marshall, who can only be described as a randy derp (sample dialogue: “Try my lovely nuts?”). On the other side of the Thames in London B,3 Rowan Atkinson plays Rowan Atkinson, screwballing with Rickman’s character in a department store. The movie ends with what amounts to a curtain call, summoning all the characters to the arrivals gate at Heathrow. It’s either a shiny bow on the ultimate Christmas comedy or a damning testimony that the movie has nothing to leave us with aside from ginned-up serendipity. If you’re inclined to believe the latter, let us call your attention to the one major character who’s absent from the airport epilogue. Earlier, we counted how many scenes characters shared — Andrew Lincoln’s silent-but-treacly cue card guy was the linchpin of that “Love, Actually” — but the other way to measure social activity is to count how many different characters each actor has a conversation with. It’s here that Laura Linney, our absentee star, our emotional glue, rises to the top. Which characters spoke to the most other characters? While everyone else is running around London, obsessed with their own problems, Linney stands as a rogue beacon of good will toward others. She’s there at Knightley’s wedding, asking the mopey best man if he needs a shoulder to cry on. She’s there at the Christmas party, reassuring Thompson, who is watching her husband fall for another woman. And she’s there for her mentally ill brother, whose incessant phone calls derail a long-awaited night under the mistletoe with Rodrigo Santoro’s abs. Linney’s character is the one that truly straddles the two Londons. In a movie stuffed with redundant plots and permutations of the same stereotypes, there’s no character quite like her. If you find yourself forced to Grinch through a viewing of “Love Actually” this holiday season, treasure Laura Linney — she’s a bona fide Christmas miracle. You can see all the data from our network analysis on our GitHub page. Ella Koeze contributed reporting. That’s love, for the record. Not confusion over missing commas. 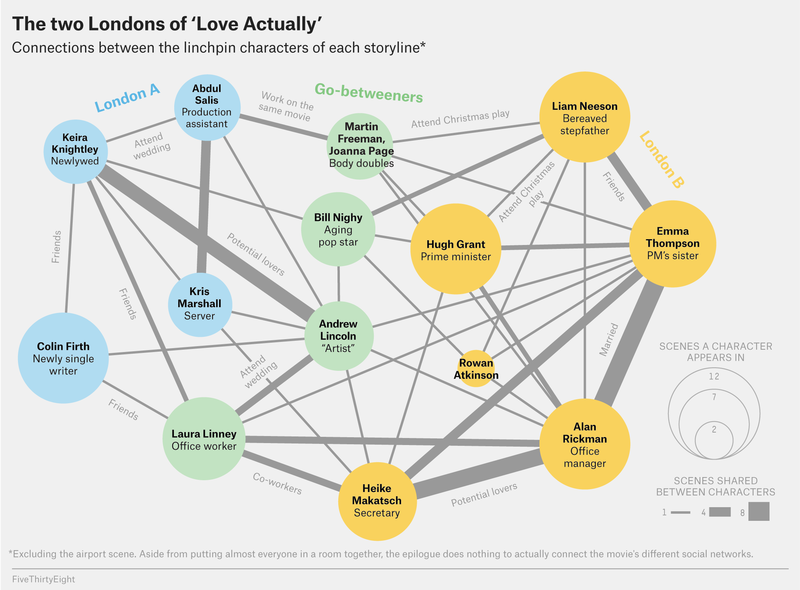 Rodrigo Santoro, Martine McCutcheon, Lúcia Moniz — there are a lot of “Love Actually” actors who we didn’t put in the chart above. That’s because they rarely cross storylines. When they do, it’s in the company of the actor who we did include, the linchpin of that plot. I have no idea if this happens on the other side of the Thames.